The kitchen is a unifying area; a place where family comes together for meals and conversation. The kitchen counter is where much of this interaction takes place. 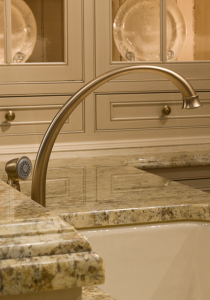 Whether you’re looking for a luxurious granite countertop or a unique design to go with your own distinctive taste, Kenwood Kitchens has been helping homeowners in Annapolis, Baltimore, Columbia, Bel Air, Lutherville, and all around Maryland create their ideal kitchen setup. Though Kenwood Kitchens won’t just do a countertop replacement only, they do provide countertops when doing a complete kitchen or bathroom remodeling project as part of their complete kitchen and bath process. A granite kitchen countertop is as elegant as it is strong. They require little maintenance, are heat and stain-resistant, are very difficult to chip and are renowned for their durability and intricate beauty. Carved from natural stone, they retain earthy hues interwoven with crystalline swirls that capture light from all angles. These kitchen counters are extremely resistant to wear and tear, scratches, staining, and mildew and mold, coming second to only to diamonds in terms of hardness. The surface is also extremely easy to clean and maintain. Granite is available in an eclectic palate of colors and patterns. Custom countertops can come in every shade of black, brown, gray, white, blue, green and red. The colors are also often laced with silver, copper and gold, and mingled with tiny crystal fragments. Pick a hue that complements your cabinets and floors. Most granite countertops are overlaid with a polished finish that gives the surface an intense glossy appearance that also minimizes its vulnerability to liquid absorption. A honed finish creates a smooth, non-reflective surface. It is not as effective as polish at sealing out humidity, so this finish is not recommended for counters that will experience heavy use. Two additional finishes – flamed and brushed – produce an irregular and textured appearance. 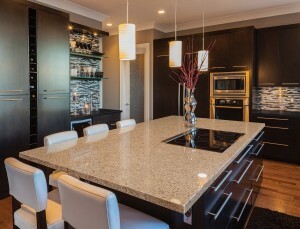 If you are considering quartz as a countertop material, you likely value the appearance of a natural stone. Quartz is engineered with a resin binder, reinforcing the strength of the material. Quartz is both chip and scratch resistant, has a non-porous, bacteria resistant surface and requires low maintenance and no sealing required. Quartz countertops are also extremely durable, stain and heat resistant. You may find that depending on your selection, some Quartz countertops may be more affordable and cost effective than granite. Marble countertops are undoubtedly enchanting, sprinkled with milky swirls and sinfully rich hues. They can be expensive, and are softer, with more required maintenance than other stones. When the luxurious look and feel of a genuine marble countertop is a must, Kenwood Kitchens can deliver the premium quality you demand while also offering a fair value. You don’t have to pay top dollar for a marble kitchen countertop with the ultimate “wow” factor. Wood delivers more than just a striking appearance that can match the wood of your kitchen cabinets, such as a functional preparation and direct chopping surface in the kitchen. Cut directly on your solid wood or butcher block surfaces without dulling knives. A growing trend with kitchen design is installing sectional areas of wood countertops. Supplement your quartz, marble or granite countertops with kitchen islands or smaller sections using natural wood. It’s all about your personal preference. For the perfect marble, quartz, granite or wood countertop in your kitchen, call (800) 211-8394 or contact us to speak with a representative.